I have a great new read for you... 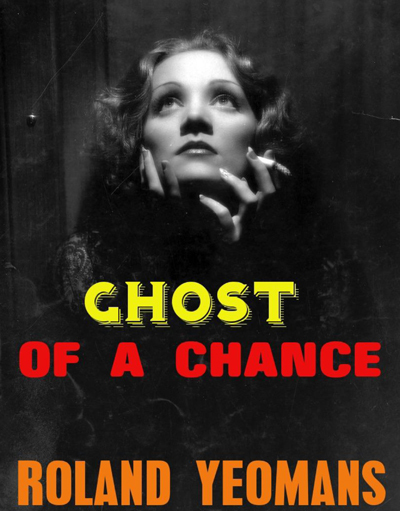 I have only started to read this book "GHOST OF A CHANCE" by: Roland Yeomans and I all ready know I love it... though my speed in reading is like finding my way out of a paper bag. I know where the top is, but just sometimes cannot reach it. It incorporates a who might have done it, using characters you might know and ones that you should. So I wanted to tell you more and in a few weeks a special something with the author "Roland Yeomans" and our friendship started cause him and I shared a very similar book cover "End Of Days" and my now scraped project "Sound-Staged" that will never get of the launch pad. Not for any other reason, that I am not sure anyone really wanted to read my craziness... I do encourage you all to take a good look at Roland's body of work... now there is talent [HERE]! I hate that my END OF DAYS cover was so much like yours. We must be kindred spirits. 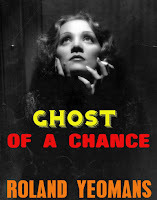 There are cobwebs on most of my novels as well, so don't feel badly about SOUND-STAGED. I just finished another or Roland's books and will dive into this one soon. Do We Need Texas Chainsaw Massacre? Retro-Sunday... and I am a winner! Spray Blood "GIVEAWAY" and Me Covered in Red!